A range of miniature illuminated or non-illuminated round rocker switches designed for panel mounting. With a choice of latching or momentary switch operation, the IP40 rocker switches are suitable for a wide range of applications. The snap-in round rockers are available with a black or white body and can be single pole or double pole configured, dependent on individual requirements. 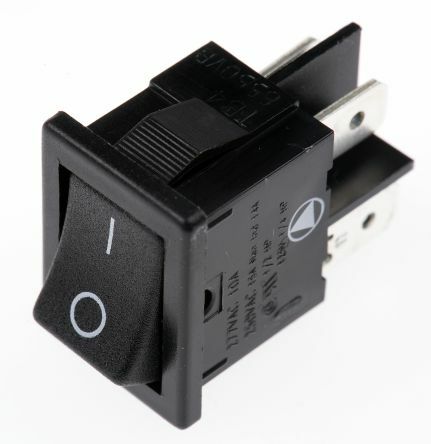 These general purpose on-off rocker switches are ideal for maintenance, repair, and new design work.  Are the round rocker switches easy to connect? Yes, the rocker switches have male quick connect 4.8 mm or 6.3 mm tab terminals at the rear. The connection is easy, simply select the appropriate sized female push on terminal. Red, Yellow or Blue dependent on wire size.  Are there any other accessories available?